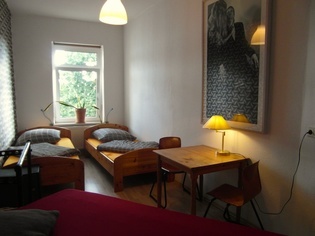 Our women's dormitory - bright and friendly with four cosy beds. Friends from around the globe - in a private atmosphere. You don’t have to book an expensive flight to Egypt, simply spend your holiday in our apartment “Egypt”, fully equipped with two rooms (one double bed and two single beds), own bathroom and a small kitchenette. our single rooms "Mars" and "Calypso"
Our single rooms "Mars" and "Calypso" in the Homeplanet-Hostel have their own washbowl and are furnished with table and chairs - charming and effective. 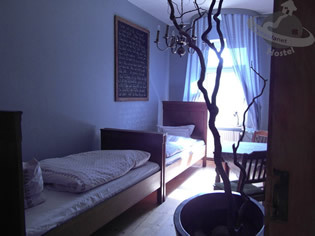 This snug room has a window overlooking the garden and offers space for two persons. It is bright and spacious for a relaxed stay also during the daytime. 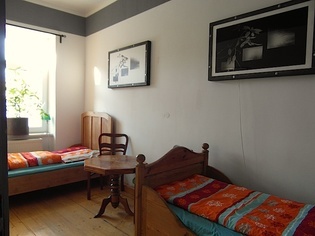 This very spacious two-bed-room with a loggia is the suite in our hostel. 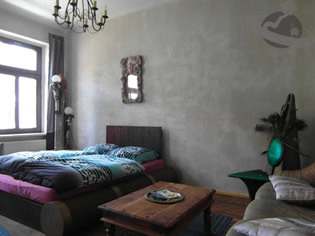 It is the largest room and will be your second home during long term stays. A quiet room with a chandelier and a window overlooking the courtyard. It has two single beds and is colored in a heavenly blue to inspire your dreams. In our individually designed domitories with 3 to 6 beds, you can use your own bed-linen or rent them for a one-time fee (see below). 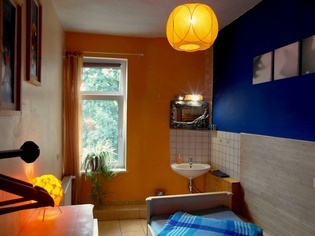 You have free Wi-Fi Internet everywhere and next to every dormitory, there is an excellent and always clean bathroom. 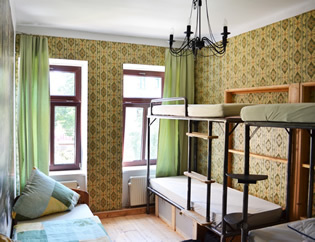 In addition to that, there is a women’s only area with a 4-bed dormitory, a double room and an own bathroom. In our Homeplanet house, you will find dormitories with 3, 4, 5 or 6 beds. The 5-bed dormitory is spacious and light and offers enough place for all you travellers. 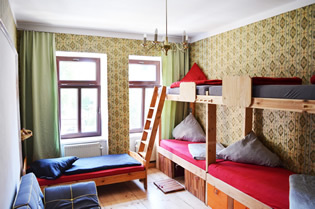 The six-bed dormitory offers two single beds and two bunk-beds handcrafted by our specialized locksmith. The 3-beds dormitory 'Astro' has a window overlooking our backyard where one can enjoy cool drinks under green trees.